Why are marrow and stem cell donors 45 and older asked to pay the lab fee for their kits? Joining the registry for the chance to become a bone marrow or stem cell transplant donor is exciting: it’s an opportunity to save someone’s life and do something good for another person. When someone 45 or older wants to join the registry, we ask them to offset the $60 laboratory cost of processing of their kit. There are both medical and financial reasons for making this request. In the 60-year history of marrow transplantation, one medical fact stands out: transplants are more successful in curing patients if the donor is younger. 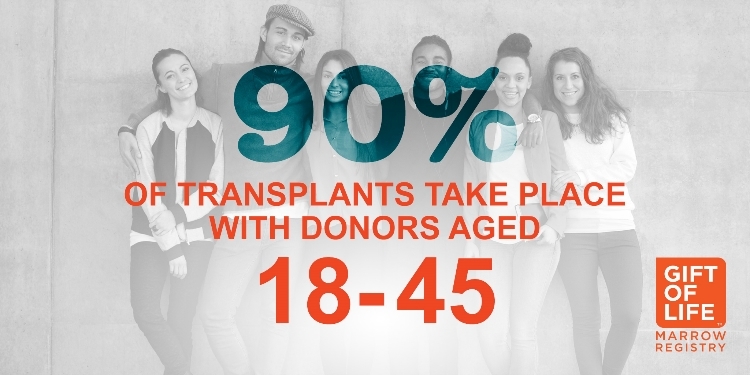 Today, 85% of requests from transplant centers are for patients under 44 years old, and by far the greatest number are for those under 30. Every doctor wants to give their patients the best possible chance of surviving blood cancer or curing an inherited immune disorder, and it is now well-established that younger donors have more robust stem cells and are overall healthier than older donors. There are also serious concerns that transplanting from an older donor to a younger patient may shorten the possible life span of the recipient, due to limits on the lifetime of cell reproduction built into the structure of cells. Telomeres, the “end caps” of the DNA strand, limit the number of times a cell can reproduce itself. As we age, telomeres are used up leaving cells unable to divide and replace themselves. This is a natural part of the aging process, but the consequences for a transplant could be devastating for a recipient. If a child or young adult received a transplant from a donor in their late 40s or older, the new bone marrow could fail before that person’s possible lifespan. Because of the high medical need for donors 18 to 30 years old, many countries are lowering the ages that are allowed to join their registries. For example, Canada restricts donors to 35 and under, Anthony Nolan in the U.K. limits registrants to 30 and under, and the age limit in Australia is 40. At this time, the United States has chosen to maintain the policy of accepting donors through age 60 – but on their 61st birthday, all donors graduate from the registry. Gift of Life Marrow Registry is a non-profit organization. We receive no government funding and rely on the support of foundations and individuals to perform our mission of saving lives. We have a responsibility to our financial supporters to make the best use of every dollar contributed to us – and the medical evidence tells us to focus on recruiting younger donors. Therefore, we respectfully request that everyone 45 years old and up who wishes to join the registry contribute the cost of laboratory processing for their kit, so that funds contributed by other supporters can be used for those donors most likely to be called for transplant.